I know many of you have problem accessing certain YouTube videos. 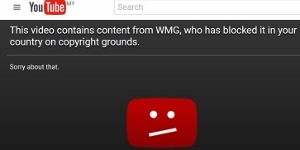 Each time when you tried to view the video, you came across the remark: "This video contains content from WMG, who has blocked it in your country on copyright grounds." There are various ways on how to to view blocked YouTube video in your country. There used to one easy method is where you just change the URL. You delete 'watch?' and the equal sign =. Then add a slash / after the letter v.
Update: Sorry, the above method DOES NOT work anymore. With the changed URL, it will take you to the video, but when I clicked on it, it says: "This video is not available in your country". But here is one method that definitely works. It is by using proxy websites or proxy servers to bypass any blocked YouTube content. Here is one easy proxy you can use to watch blocked YouTube video or any other blocked videos online in your country. 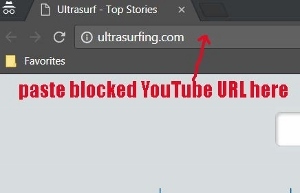 Ultrasurf is one of the popular anti-censorship, pro-privacy software, many Netizens are using it to bypass internet censorship and protect their online privacy. Here is a site where you can download UltraSurf. 1. Go to:http://ultrasurf.us to download the latest version. 2. It is in a zip format. To open a zip format file, you need to have WinRAR installed in your PC. 3. 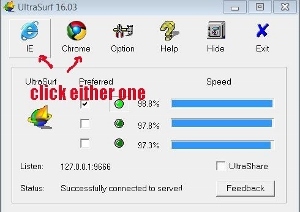 After you have downloaded UltraSurf, go to where you have saved the file. Double click on the u.zip. 5. Now you should see this box pops up. 6. You can click open either Windows Explorer or Google Chrome browser to look for your blocked YouTube videos. 8. Then you press on the "Enter" key on your keyboard. 9. That's all. Now you can enjoy the blocked YouTube video with hassle. 10. In fact you can access all those blocked websites in your country. * Here is another way to watch blocked YouTube videos and other blocked websites with FoxyProxy.